Remember the sports complex being constructed in 2007 by former PTA GM Robert Dean Barbers right beside the walls of Intramuros? It turns out, heritage won the case last year. And I only found out about it after Bambi Harper casually mentioned this to me at a U.S. Embassy event last Holy Week. So I asked her for a copy of the decision. Petitioner through the Office of the Solicitor General assails via this Petition for Prohibition with prayer for Temporary Restraining Order (TRO) and a Writ of Preliminary Injunction the construction of the sports complex undertaken by the public respondent, Hon. Robert Dean S. Barbers, General Manager, Philippine Tourism Authority through the contractor, private respondent Basque (should be Bosque) Construction Corporation. Petitioner claims that the project was undertaken by the respondents without the required permit and locational clearance from petitioner in violation of Section 3, Rule VIII of the IRR (Implementing Rules and Regulations) of Presidential Decree No. 1616 and that it also violates the pertinent conditions embodied in the Memorandum of Agreement entered into by them sometime in 1981. Moreover, although admittedly, the project site is on a parcel of land owned by the public respondent, Article 428 of the New Civil Code provides that "the right of an owner over his property is not absolute but is subject to certain limitations established by law". Under the Memorandum of Agreement entered into by petitioner and PTA, the properties ceded to PTA under PD 1763 shall be utilized and developed strictly in accordance with the charter of petitioner, its development plan, its rules and regulations and such other policies as the Board of the herein petitioner may formulate. On the last page of the said Memorandum of Agreement, the signature of the then President Marcos appears immediately below the entry which reads "upon authority of the President". It clearly appears then that the execution of the Memorandum of Agreement was in accordance with the mandate of PD 1763. It follows that the project did not comply with PD 1616 requiring a permit and developmental clearances from petitioner. It also violated the Memorandum of Agreement between petitioner and the public respondent which has the force of law between them. It will be noted that petitioner here is the Republic of the Philippines suing through IA Board of Administrators represented by its Chairman Secretary Durano. Under PD 1616, the Intramuros Administration is mandated to restore and develop Intramuros as a monument to the Hispanic period of Philippine history. Indeed, Intramuros has been priceless heritage for the City of Manila and a major historical landmark of the country. It is our nation's link to the past. Clearly, the construction injures the rights of Intramuros Administration and the nation as well. The court shares the view of petitioner that it is every Filipino's right to have a part of the national heritage like the Intramuros wall protected, preserved, restored and enhanced. Also, for those reasons, the court finds the arguments of the respondents untenable. WHEREFORE, let a Writ of Prohibition issue directing respondents to cease and desist from continuing construction of the sports complex. The Writ of Preliminary Injunction earlier issued is hereby declared permanent and respondents are also ordered to demolish the illegal construction at their expense. With costs against the respondents. 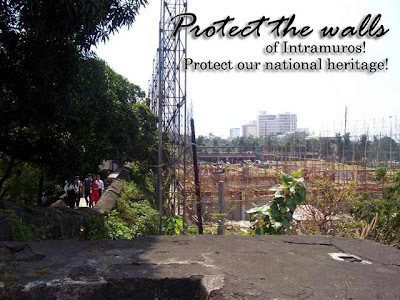 Protect the walls of Intramuros! YEAH!!!! Thanks to all involved!!! Thank God,there is still a few good minded judges in our country.3 cheers for Intra! Mabuti naman at nahinto yung construction. Imagine the damage that would have done to a National Heritage had it continued? Thanks for posting Ivan! Wish ko lang, Sana mas malaki yung mga photos mo instead na collage type. :-) I love your blog. Thanks Lorenzo! Marami kasing pictures. So the collage is the solution. Haha! Thanks Ivan for this post. Good thing the petitioners won this case. I hope more people will continue to fight for the protection and preservation of our heritage sites.